Sensitive systems need gentle proteins to keep everything working properly. Some dogs find lamb to be a soothing alternative to other sources of protein. Combined with a great assortment of veggies and fruits, all systems are go! 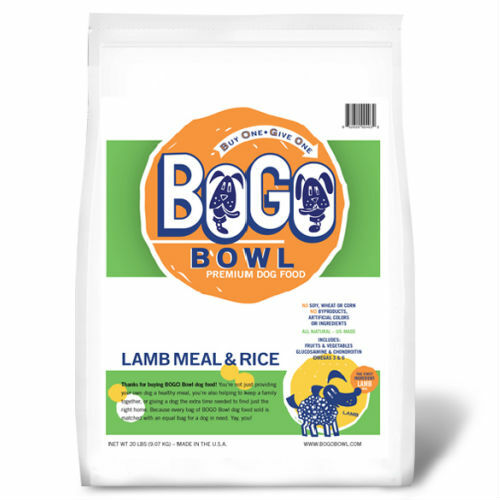 BOGO Bowl's Lamb Meal and Rice Formula dog food blends all natural New Zealand lamb protein, healthy vegetables and fruits. We don’t use corn, wheat or soy and there are no artificial ingredients. Includes omegas 3 and 6, glucosamine and chondroitin. Rated 4 star by DogFoodAdvisor.com. INGREDIENT LIST: Lamb Meal, Brown Rice, Ground Grain Sorghum, Oat Groats, Canola Oil, Millet, Menhaden Fish Meal, Dried Plain Beet Pulp, Potato Product, Tomato Pomace, Natural Flavor, Whole Ground Flaxseed, Monosodium Phosphate, Carrots, Celery, Beets, Parsley, Lettuce, Watercress, Spinach, Lecithin, Chicken Cartilage, DL-Methionine, Potassium Chloride, L-Lysine, Choline Chloride, Lactobacillus Acidophilus Fermentation Product Dehydrated, Cranberry, Yucca Schidigera Extract, Fructooligosaccharide (FOS), Glucosamine HCL, Calcium Carbonate, Vitamin E Supplement, Mineral Oil, Ascorbic Acid, Niacin Supplement, Organic Dried Kelp, d-Calcium Pantothenate, Riboflavin Supplement, Biotin, Vitamin B12 Supplement, Thiamine Mononitrate, Vitamin A Acetate, Pyridoxine Hydrochloride, Citric Acid, Vitamin D3 Supplement, Folic Acid, Iron Sulfate, Zinc Sulfate, Zinc Proteinate, Iron Proteinate, Copper Sulfate, Zinc Oxide, Manganese Sulfate, Manganese Proteinate, Copper Proteinate, Manganous Oxide, Selenium, Calcium Iodate.